What is a Palmar Fasciectomy? Palmar fasciectomy is a surgical procedure that removes parts of the palmar fascia, a thin sheet of connective tissue in your hand that is shaped like a triangle. Treatment may involve improving joint alignment and partial removal of the fascia. Most often, this procedure is performed to treat severe Dupuytren’s disease. A fairly common procedure, patients do not have to undergo a long hospital stay or recovery period. In fact, palmar fasciectomies are typically performed as outpatient procedures under regional anesthesia where patients can return home the same day. When is a Palmar Fasciectomy Needed? This surgery is recommended when a patient’s hand condition progresses to a point where they experience a reduced ability to complete daily tasks with the afflicted hand. The condition must cause significant problems in order for a surgeon to elect to perform this procedure over more conservative measures such as observation, PNA, or collagenase injection. Fingers contracted more than 30 degrees at the first knuckle. Progressive contracture at the second knuckle. Persistent pain and interference with ADL. The partial palmar fasciectomy is a known surgical treatment for Dupuytren’s disease, also called Dupuytren’s contracture, and it is the most widely accepted surgery for the condition. Dupuytren’s disease is a progressive condition and is characterized by unusual cords and knots of tissue forming in the fascia. These growths fasten to the palmar skin. It may spread causing the fingers to bend towards the palm at the first or second joint. 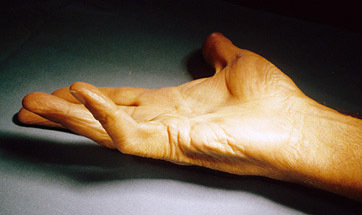 The small and ring fingers are the most commonly affected by Dupuytren’s disease. What Does a Palmar Fasciectomy Entail? Patients will decide with their surgeon which fingers will be operated on and whether a regional anesthetic is preferred. This procedure is outpatient, meaning the patient returns home the day of their surgery. The surgeon will make incisions from the palm to the afflicted fingers and abnormal fascia is removed. This allows for improved range of motion of the affected digits by removing the fascial tethers. Most patients experience improved hand function soon after surgery. Swollen fingers take time and occupational therapy to maximize function. Many patients may experience diminished sensation or tingling, which generally improves with time. Stitches are removed about two weeks out from surgery. Therapy is an important aspect of recovery. Hand exercises with a therapist and at home will improve flexibility and range of motion, and may aid in minimizing future problems. Splinting is often used temporarily. If You are Experiencing Hand Pain, Contact HandSport Surgery Institute. Please contact us as soon as possible to schedule an appointment with our talented team. People who have been diagnosed with Dupuytren’s disease should be evaluated to try to prevent further deformity and mobility issues.